The Combustion Institute is an international, non-profit, educational and scientific society. Founded in 1954, CI promotes and disseminates research activities in all areas of combustion science and technology for the advancement of many diverse communities around the world. The International Symposium on Combustion is the major biennial meeting of The Combustion Institute. The deadline for submissions of papers for the 38th International Symposium on Combustion in Adelaide, Australia, has been established as 23:59 PST, 07 November 2019. The Combustion Institute and Elsevier are proud to announce the winners of the 2019 Hiroshi Tsuji Early Career Researcher Award. Dr. Aamir Farooq and Dr. Greg Rieker are recognized for their significant contributions and research in fundamental or applied combustion or combustion-related fields. They will be honored for receiving this award during the 38th International Symposium on Combustion in Adelaide, Australia in the summer of 2020. Click here for more details. The Call for Papers for the 38th International Symposium on Combustion has been released. 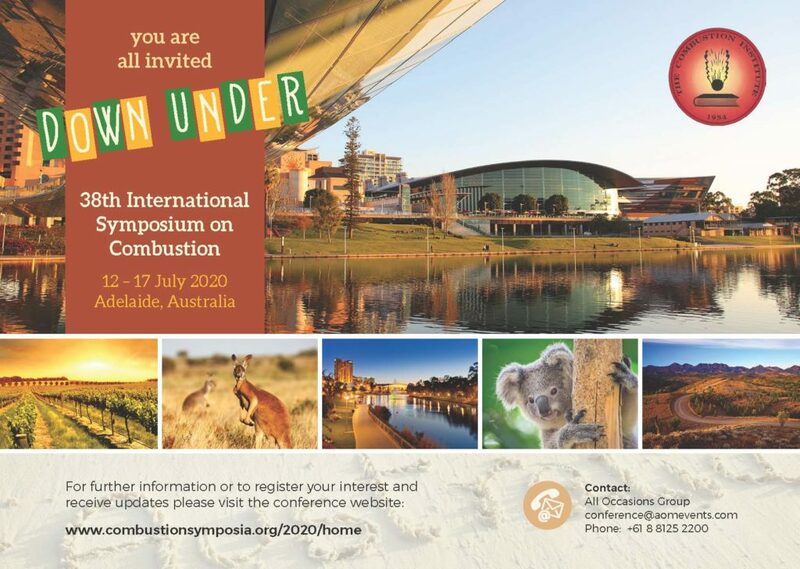 The 38th International Symposium on Combustion will convene at the Adelaide Convention Centre, Adelaide, Australia from Sunday, 12 July through Friday, 17 July 2020. Scientists, engineers, and others interested in combustion are invited to attend and participate in this biennial world congress of The Combustion Institute.